I test out the world's first email conversation app for my latest review. Find out how Spike lived up to the challenge in this Spike review. This one I was really looking forward to reviewing. I found out about Spike – the world’s first email conversation app – earlier this month and decided to test it out to see if it will match my needs to simplify my overwhelming, always-cluttered email inbox. Previously known as Hop Email, Spike packs some powerful options to manage email, carry out conversations, take notes, manage appointments and more. 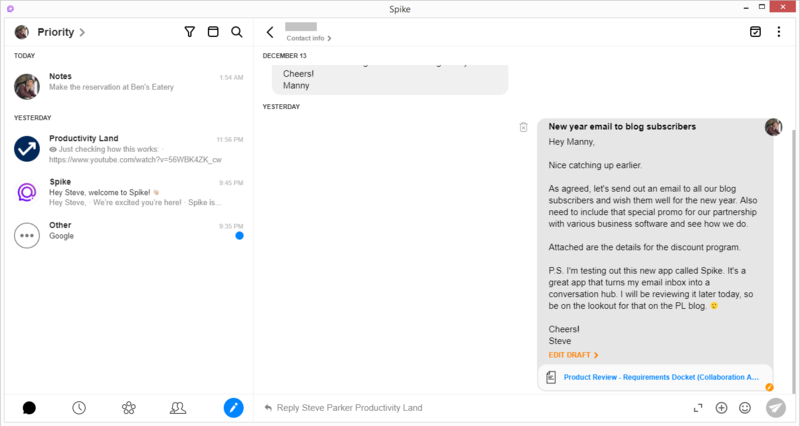 In this Spike review, I will be talking about some of its features, the simple yet elegant interface of the app and how it supercharges email inboxes to turn them into collaboration hubs. Spike is ideal for micro-businesses, freelancers and SMBs who need an efficient communication tool to help them save time while growing their businesses. 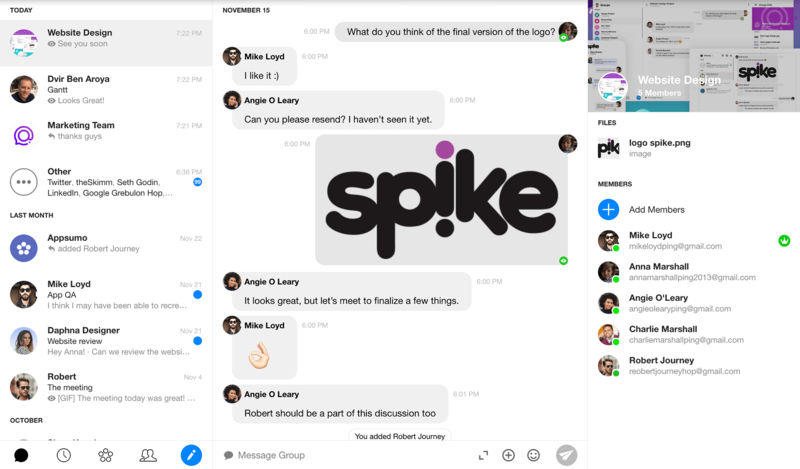 Spike is the world’s first conversational email. We’re changing the way consumers and business communicate both internally and externally to their company, becoming much more efficient in their daily lives. Spike is much more than an email client. We are the only solution that takes all the benefits from email and messenger and combines them together. Small business, many of which are not tech savvy, may not have the resources for implementing them (time, financial, IT). Spike gives small businesses the ability to communicate faster. Just use your email. Done. I found Spike to be extremely easy on the eye. The on-boarding experience was fairly simple, everything was exactly where it needed to be and I kept feeling déjà vu while using it. Why? Because it’s so similar to what we do every single day – chat, whether it be on social media or collaborating at work. This means Spike has done a wonderful job with the user experience and interface. If you’ve used comprehensive project management software before, operating Spike will just be a walk in the park. The words that first came to my mind after using Spike were clean, simple, and intuitive. I’ll be honest, I love the idea and clearly understand the value it brings with its simplicity and modern interface. I can keep gushing about how much I like Spike but one more thing that I want to bring your attention to is its easy navigation. The icons are well laid out, meaningful and never make you take your focus away from the action. In a nutshell, Spike is cleverly designed with easy navigation, usability, and organization in perspective. The onboarding process was simple and easy to get done with. It asked me my email and authenticated me using Google SSO (since I used my Gmail account), then my name and my picture. Nothing complicated. Spike scores a really impressive 9.0 out of 10 for its features and functionality. This is because there are a lot of features that you do not usually get with a free collaboration tool. Soon as you sign up, you are redirected to your Home. All your messages lay here sorted by contact names neatly. Clicking on a conversation thread from the left panel and it will open all the email messages received from the contact, from where you can select a specific email. The email then previews on the right side. Your group chats also appear in your inbox – we’ll talk more about group chats in Spike in a bit. 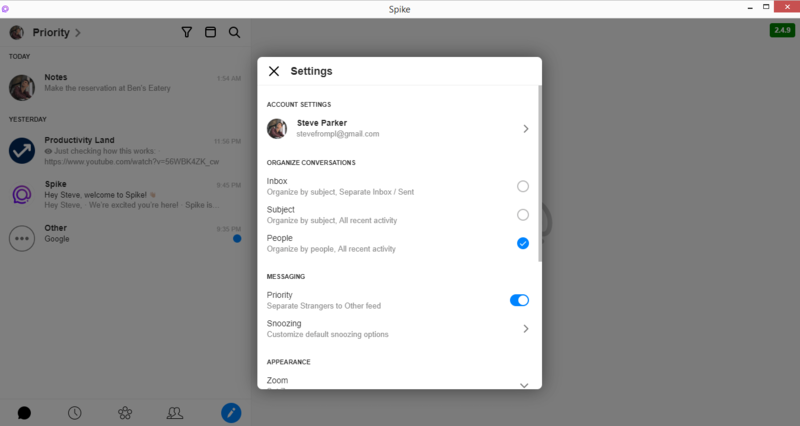 For cloud attachments, Spike integrates with Google Drive, Dropbox and OneDrive. Leave the message midway and Spike saves it as a draft for you to get back to it later. Drafts can be accessed by going back to the email message preview or via the folder drop-down menu present on the main navigation panel on the left bar. Message attachments work like a charm. You can easily preview standard file types inside Spike. I tested out 4 file types, and they were previewed perfectly inside Spike – a PNG image, a Word Doc, a PDF and a video file. No problems there. Your timeline is your calendar in Spike. It integrates seamlessly with your email calendar, and you can directly create appointments, set up events for yourself, or create meetings and invite people through the timeline. For group chats, you can create groups in Spike. Groups are a bunch of people who can be from work, home, school or elsewhere who you collaborate with. Create a group or choose from one of the default ones created by Spike to get started. Once you’ve set up your group, you can start using group chats to communicate instead of rolling out emails for every little thing. Any group chats that you are a part of will also show up on your Home for quick and easy access. One-to-one DMs and messaging is a part of your conversation thread with the contact. You can’t create standalone chat channels for one-to-one conversation and keep them separate from email threads with the same contact. Basically, your email thread is also where you can chat. However, you can start one-to-one conversations with a group member and keep one-to-one conversation threads (chat+email) separate from the group chat channel. Another important thing about Spike is its ability to avoid silos. If the other person is not a Spike user, any and all group chat messages will be received via email. They can also reply to those messages and you will receive them in your group chats. This avoids the unnecessary condition to be on the same platform to use Spike, which is great. Spike allows for both chat-to-email and email-to-chat to keep everyone, Spike user or not, in the loop. It would have been nice if I could create additional folders to sort other email for custom categorization. Your folders are accessible using the folder drop-down present on the top bar of your left navigation panel on your Home screen. People are all your contacts in one place. It is your address book of all your people who you’ve communicated with in the past. There are Frequent contacts which display at the top, and the rest of the people who you don’t communicate with on a frequent basis. I did not find an option to add a contact on either the web app or the desktop client for Windows. This might be a bug. I did have the + button to add a contact on the Android app (more on Spike for mobile in a bit). Spike also offers its users the ability to conduct audio and video calls with their contacts on Spike. However, this function is only limited to the mobile apps for now. I did not find the option to conduct audio/video calls using the web app or the desktop client for Windows. I must commend Spike for being truly available across different platforms. 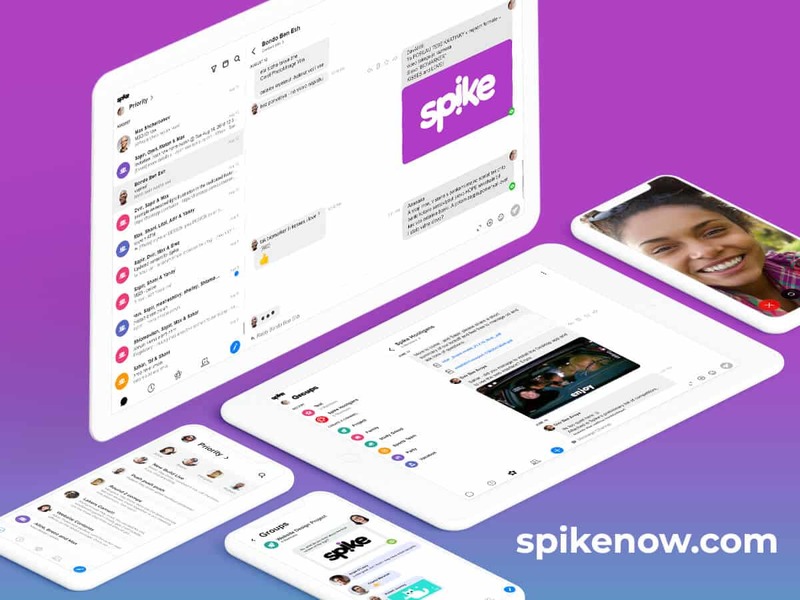 Spike is available for both Android and iOS, which is excellent since you always need to stay in touch on the go. 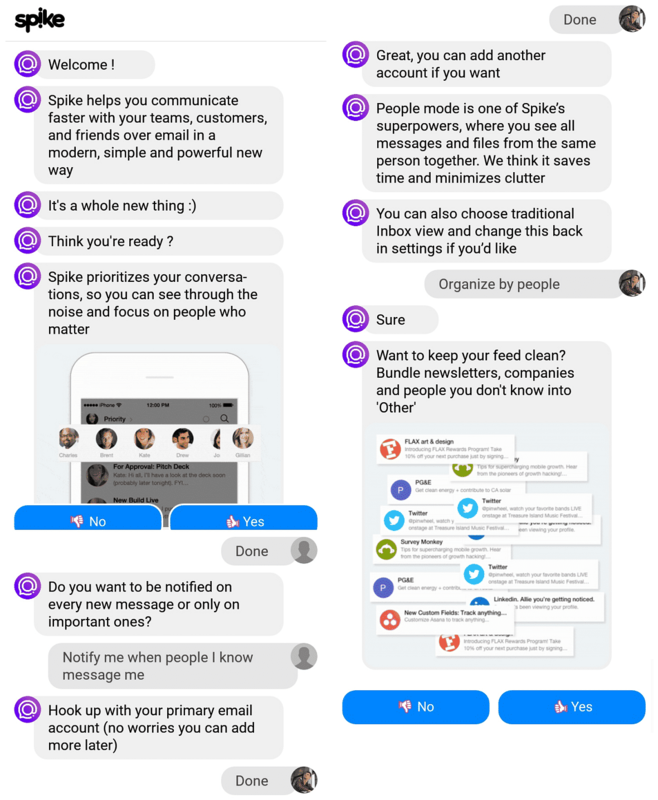 I downloaded the Android app, and Spike’s onboarding chatbot initiated a conversation with me to help me get started. Spike for Mobile adds more value on top of the desktop and web versions. It enables you to conduct audio/video calls with your contacts. The mobile apps also provide GIF support on top of emojis. You can also send in photo and video messages using the mobile apps. Overall, using Spike for Android was a pleasant experience and it was easy to navigate through the application. No lags of any kind, nothing was out of place. Job well done. All the conversations, events, files and people would be hard to keep track of without a powerful search feature in Spike. And you do get powerful search placed right on top of the left navigation panel on your Home screen. You can search for files, emails, chat messages, people, keywords and more without having to open any conversations or threads. For easy navigation across the application, there are a range of keyboard shortcuts that Spike has enabled. Ctrl + Enter sends the email while Ctrl + Alt + X moves an email message to Trash. These keyboard shortcuts can really come in handy to remember the usual activities and can save a lot of time while using Spike. To know more about keyboard shortucts in Spike, click here. You get a lot of configuration options for your Spike account, but account settings are easy to understand. You can edit your name and your avatar. You can organize conversations by subject, people or by the classic inbox view in a standard email client. You can enable/disable the Priority view on your Home so that Spike doesn’t move conversations with strangers to the Other view we talked about earlier. There are also settings for default zoom, which is a great feature since text can be difficult to read on varying screen sizes. You can also make some configurations for your calendar and choose the first day of the week. There is also an option to customize notifications. You can show/hide badges next to conversations that have an unread message. You can also enable/disable preview text for new message notifications. Lastly, there are some old-school email settings such as a text-only email signature and aliases to add other email addresses to your Spike account. For any personal account (such as [email protected]) is free and you can connect as many as you want. You can enjoy an unlimited free plan for personal use or flexible monthly/annual plans for business accounts. Here’s how the pricing plans look like. Free Free forever For personal email addresses. Learn more about Spike’s pricing plans here. Spike treats all data with the highest sensitivity and security to ensure that user data is protected. Here are a few measures that Spike takes to ensure availability, reliability, and security of data. Full disclosure of mode and place of processing data ensuring GDPR compliance. Data is encrypted on Spike’s servers using the AES-256 algorithm. Supports email providers that use the OAuth protocol (like Google, Yahoo, and Microsoft) as well as providers that use an App Specific Password (like iCloud). Spike offers a variety of support channels and I am yet to find a bad review for their customer service. They have an extensive knowledge base answering all possible questions you might have regarding Spike in their help center. Alternatively, you can also chat/email with the customer support representative any time from within the application itself which makes it super helpful. Here are some ways Spike helps you get started with your journey or/and aid you when you need them. I enjoyed using Spike and testing out all its features. It is really a powerful tool to organize email and use it for more than just email itself. My experience was pleasant, and I really liked the simplicity of their design. How about you? Will you use Spike to organize your email inbox? Let me know in the comments below. You can also use ratings to impact the overall score. So, do leave us your ratings. What business collaboration software would you like me to review next? Ping me at [email protected] with your ideas and suggestions.